The history of softball/fastball in MacTier dates back to the1930’s. It was after World War II ended and the servicemen came home when ball teams were again being organized. 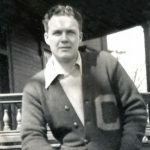 In 1945, Ralph Pender of Parry Sound who worked as a Canadian Pacific Railway yardman and who lived at the boarding house in MacTier, formed the Intermediate “C” men’s team that competed against teams from Parry Sound, Britt and Gravenhurst. Ralph coached this team to the town’s first big championship in 1946. Gene Rouselle, ten at the time, recalls that Ralph was a great guy and has fond memories of being the bat boy despite the fact he had to carry the bat bag and equipment from the boarding house to the ball park and back for all games and practices, a bag that weighed more than Gene did. It was 1952 when Ralph passed away. In 1954, Aub Allsopp (2005 BOHOF Inductee and local businessman) was a member of the MacTier Flyers when they won the Northern League Championship. This began his era with MacTier softball/fastball. 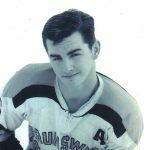 He could see the potential of the MacTier players and with his excellent ability and contacts, he would import players from other towns to better his teams and he would very often employ some of the players at his store. In 1962, while Gene Rouselle was living in MacTier and playing senior fastball for Midland, Aub asked him to coach some young local ball players and Gene accepted as it would also present more opportunity for him to be home with his young family. In 1963, Manager Allsopp and Coach Rouselle developed a team comprised of MacTier players Murray Jones, Wendall ‘Wink’ Fisher, Jimmy Blanchard, Paul Simpson, Cavan Simpson, Rusty Morgan, Blain Fisher and from Parry Sound, Rick Thomas. They had to recruit both a pitcher, Billy Pandke from Sudbury and a catcher from Toronto, Robby Canning, who vacationed each summer at Foot’s Bay. Gene Rouselle also reached out to a great softball man from Parry Sound, Earl Thomas, to be his Assistant Coach. Gene and Earl had played together for the MacTier Intermediate ball team and Gene knew Earl would be a great asset to the team. This 1963 MacTier Legion team entered the Ontario Amateur Softball Association (O.A.S.A.) playdowns and won the North (Zone Champions) by beating Capreol, but lost in the finals of the All Ontario Juvenile “C” Championship in two straight games to Norwood 5-4 and 4-3. In 1964, with Murray Jones and Wink Fisher not returning to the team, others had to be recruited, including Gerry Whalen of Mactier, Jack Barrett of Foot’s Bay and Parry Sound players Brian McKenna, Wayne McKenna, Bobby Orr, and Sandy Heidman. The combined populations saw the OASA move them to the higher classification of Juvenile “B”. This team was managed by Aub Allsopp, coached by Gene Rouselle and Earl Thomas and captained by Cavan Simpson. The Muskoka Fastball League consisting of teams from Bracebridge, Gravenhurst, Beaver Creek, Huntsville, and MacTier was very competitive in 1964. Strong opposing pitchers like Eddie Gelinas of the Gravenhurst team helped to build the batting skills of the MacTier team. The excellent competition in the league that year and the dedication of players who loved the game, who had tremendous work ethic and who enjoyed putting forth their best effort all the time, whether it be in the many, many hours of practice or in a game, were all instrumental in their success. These strengths produced a team that was sound defensively and offensively, had a strong bench, and was solidified through the superb pitching of Billy Pandke. When Aub had occasion to coach third, everyone knew when the batter was being asked to bunt because the signal was patting his hand on top of his snuff can that was in his other hand. 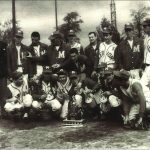 The 1964 MacTier Legion Flyer Juveniles won the Muskoka League, the Northern Ontario Championship by defeating Espanola and went on to play the OASA Juvenile “B” finals in Grimsby. Both games were very competitive, but the defensive strengths of the MacTier team produced rewarding victories. MacTier won the games 3-1 and 2-1 making only two errors over the weekend. 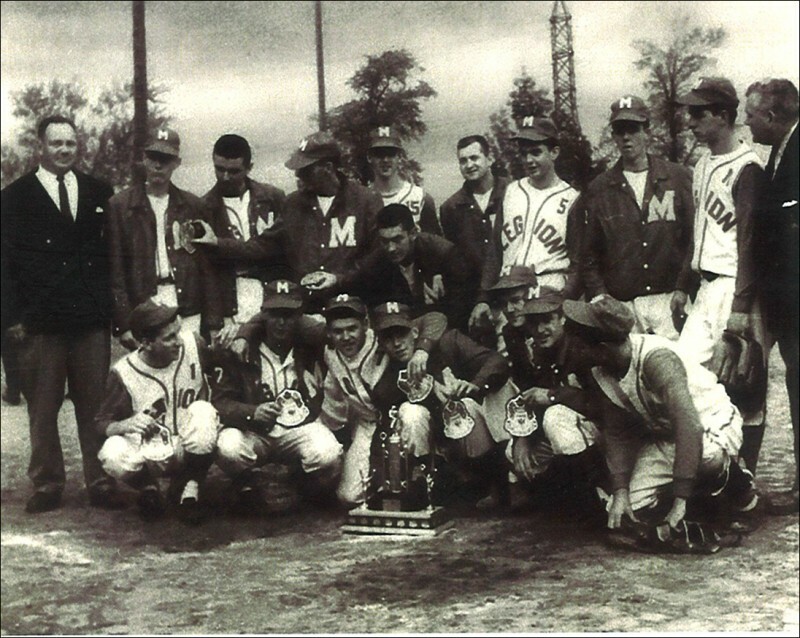 The 1964 team was the very first Ontario Champion in softball/fastball from the Muskoka and Parry Sound area. It was a long awaited dream for Mr. Allsopp, who according to his players, spent all of his time pacing around the field in a state of anxiety, until the final out was made as centre fielder Sandy Heidman made the catch that ended the series. Coaches Gene Rouselle and Earl Thomas and Manager Aub Allsopp could not have been more proud of their team. 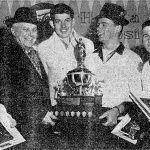 In 1965, the Legion Flyers again won the Northern Ontario Championship by again defeating Espanola but losing to Tavistock in the OASA Juvenile B Finals. The Legion Flyers lost the first game 3-2 in fourteen innings, won 3-0 in game two, and lost 3-0 in game three. In 1966, as the players reached Junior age, they were moved to Junior B by the OASA and yet again they made it to the finals and were defeated by Zephyr, who were taking the trophy home for the second consecutive year – an extremely difficult task. Also in 1966, while the MacTier Legion Flyers were playing Junior B, Sandy Heidman was coaching the MacTier Bantam B Club who won the Zone Championship. The following year while they were Midget B, they repeated the win. By 1969, another OASA Ontario Juvenile Championship was celebrated and some of those BOHOF alumni are here again today. Mike Brawley of the 1969 MacTier Legionnaires said it well: ”It will be nice to see all of the members of the ‘64 team; after all, they set the standard for those of us up and coming. Your team was so strong offensively and defensively“. A worthy quote from Rick Thomas: “We had such a great time and made many fond memories; we were so fortunate to have such good influences in our teenage years”. Rick pointed out that every player, coach and manager knew that a large contributor to the success of softball in MacTier was the constant support received from the community year after year. Incredible support also came from the Legion representative Bob Blanchard as he was there at every call. Both Brian Lemkay and Wally Gehrke were always there to respond at Aub and Gene’s command. Arden Poe would constantly respond quickly to dragging the ball field or running to Bala to get sawdust for the field. Honourable mention must also go to Umpires Don MacDonald and Jack Grieve, both railroaders, who were there to umpire so professionally. These 1964 MacTier Legion Flyers practiced hard and played hard under the terrific coaching of Gene Rouselle and Earl Thomas. On this, the 50th Anniversary of their OASA Juvenile “B” Championship, these good friends are back together today at the Bobby Orr Hall of Fame and this honour is accepted with great pride by each player and Coach Rouselle as well as the representatives for those we remember: Captain Cavan Simpson, Assistant Coach Earl Thomas and longtime Manager Aub Allsopp. Team Members: Rick Thomas, Blain Fisher, Brian McKenna, Jim Blanchard, Paul Simpson, Robby Canning, Wayne McKenna, Bobby Orr, Jack Barrett, Russ Morgan, Cavan Simpson, Gerry Whalen, Billy Pandke, Sandy Heidman.